Optical bonding is the process of adhering two or more substrates typically using clear, liquid adhesives. These liquids may include silicones, epoxies and acrylated urethanes that have a refractive index of approximately 1.5 to minimize the reflection losses between the two media. Relative to electronic displays, optical bonding is the process of affixing a rigid glass or plastic substrates to the front surface of the display. As shown in the figure below, every untreated surface in a display system has a reflection loss of about 4.25% (index-dependent) per surface. This equates to a significant reflection loss under high ambient light conditions and subsequently compromises display viewing. Most commercial off-the-shelf (COTS) displays are not designed for direct viewing in bright, outdoor conditions. Optically coupling a cover glass to the front polarizer of the display virtually eliminates reflections from the rear surface of the optical filter and the front surface of the display system. Front surface reflection is further reduced by the application of a thin film dielectric layer commonly known as a broadband antireflective (AR or VAR) coating. 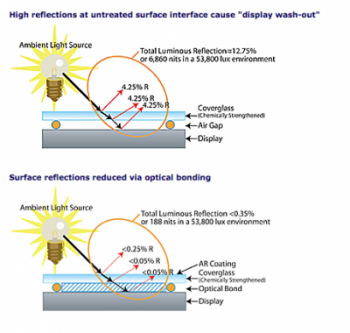 A broadband AR coating can have average photopic reflection of less than 0.25% (VAR-0.25). In a high ambient light environment (> 30,000 nits), a 4% reflection loss often exceeds the display’s luminance.